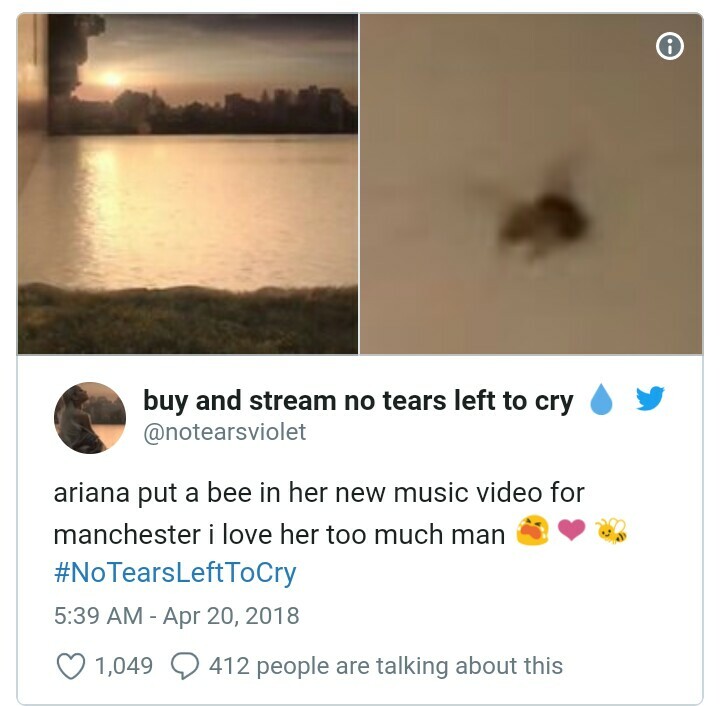 Ariana Grande has come back with her first new music since the fear monger besieging that executed 22 individuals outside her Manchester Arena appear in May 2017. No Tears Left To Cry implies the assault, while diverting the strength and positive thinking of her One Love advantage show, held only two weeks after the barbarity. 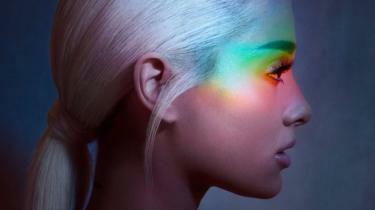 "Ain't got no tears left to cry," she sings in the single's taking off melody. "So I'm adoring, I'm living, I'm lifting it up." Delivered by Max Martin, the melody changes from its grave, gospel-roused presentation into a summery pop banger - blending Grande's enthusiastic vocals with a swift move beat. Expressively, Grande makes plans to beat dread and disdain "notwithstanding when it's sprinkling down". "We're far excessively fly, making it impossible to share in this despise," she sings. "We over here vibin'." Toward the finish of the music video, a working drone - the image of Manchester - flies towards the camera, in praise to the city. The 24-year-old has been prodding the melody via web-based networking media since Tuesday, when she tweeted a tear emoticon took after by a message telling fans, "missed you." Consequent messages contained the title in a topsy turvy, back-to-front text style; and the single's craftsmanship - a turned gray out photo of Grande, with a rainbow smeared over her eyes. 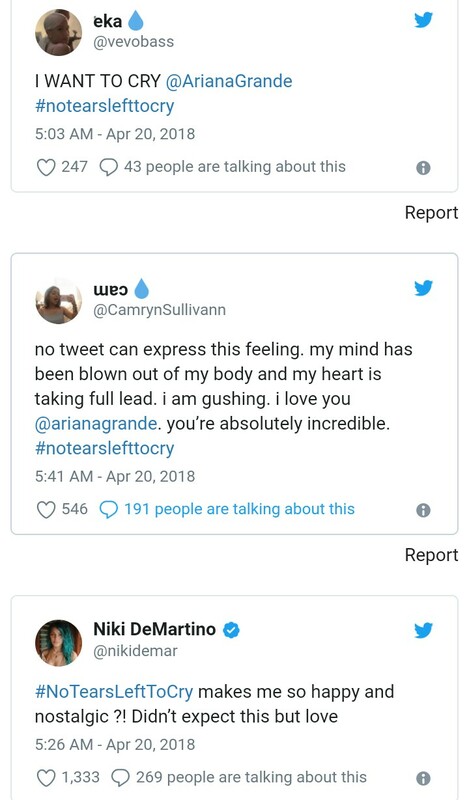 Talking prior this year, Grande's chief, Scooter Braun, said the star had "sobbed for quite a long time" over the death toll in Manchester. "She felt everything - each face they reported, each name, she wore on her sleeve. All of feeling since that is her identity." Grande additionally said she had been hesitant to come back to the studio following the attacks, telling Billboard magazine that finishing up her reality visit had "been a considerable measure inwardly". "It is pleasant to truly hold my friends and family close for a brief period, remain home for a tad," she included. 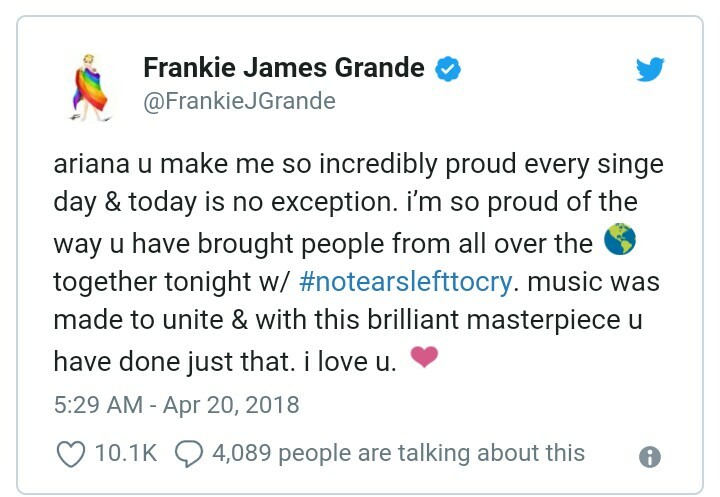 Grande in the long run entered the studio toward the end of last year, working with Martin and Pharrell Williams, who told the LA Times the vocalist's new verses were "stunning". "The things that she needs to state on this collection, it's quite next-level," he included. No Tears Left To Cry debuted worldwide at 0500 GMT, with the UK make a big appearance on Adele Roberts' Radio 1 appear. It finds the star rising up out of distress and urging fans to "accompany me". "At this moment I'm in a perspective I need to be in, similar to, constantly," she sings resistant. "I'm cherishing, I'm living and I like it." #NoTearsLeftToCry drifting around the world, while the Dave Meyers-coordinated video was observed a large portion of a million times in only 30 minutes.